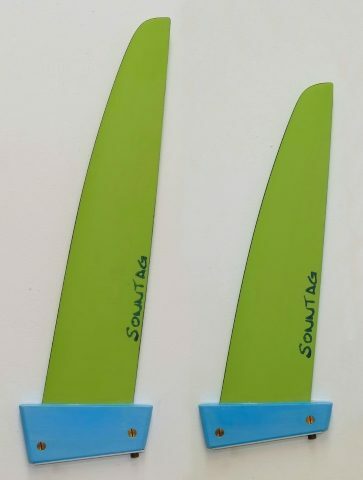 The SL-pro is our latest competition slalom fin designed to win races. We tested and tuned the carbon layups over the last 12 month in our team with Ben van der Steen giving the key input for testing under slalom competition conditions. General fin performance and speed aspects were covered by Peter de Wit, Twan Verseput, Patrick van Hoof and Fabian Blanke. We developed new outlines allowing us to fine tune the fin’s characteristic for low drag and high efficiency. The carbon layups finally shown best performance have very low geometric twist and a medium stiff bending curve with a bit stiffer mid2tip stiffness. The profile is specifically designed for the SL-pro and offers low drag at small AoA by a thinner and sharp leading edge section still giving enough grip to accelerate seamless after the jibe from lower speeds. The SL-pro induces stable vertical lift for sailing the board over the complete length in a high position “on” the water. Our test team calls this characteristic the “foiling” mode. Here the fin takes a significant portion of that load the board is normally carrying. The SL-pro is available in length of 28-48cm and Tuttle and Deep-Tuttle bases. You can find much more details about the SL-pro regarding design and sailing characteristic including a size chart on our website on the page: SL-pro.